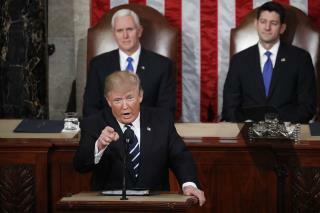 (Newser) – Early in his speech to Congress Tuesday night, President Trump said he was making good on his promise to "drain the swamp" in Washington, DC. It seems, however, that Democrats disagree. Some laughter and derisive noises could be heard in the audience, as captured in this video captured by Mashable. "I heard some tittering," writes Carl Hulse at the New York Times. "They think the cabinet is the swamp." A blogger at the Nation tweeted that "a number of Democratic members theatrically stifled laughs when Trump said he'd drained the swamp." Next on Newser: The Super-Tall Tend to Die Young—but Why? He's relocated the whole Florida Everglades to the former Rose Garden area. Gimme a break. Most corrupt presidency ever. The "Lady"....... no, that word does not work, lets say the non-male members of congress looked like a little gaggle of dental hygienists in their white lab coats. First of all, he's firmly inside Putin's underoos, but even so, he can't "lifetime ban" anything when he won't even be in this job for many more months. Maybe he thinks this President gig has tenure.